Part of the Department of Labor’s (DOL) mission is to promote the retirement security of America’s workers, a goal that has become increasingly challenging. One tool for assessing the adequacy of retirement income is the replacement rate. However, recommendations for the replacement rate that a household should target vary widely, in part because of the diverse underlying assumptions used to develop the rates. GAO was asked to review what consumption in retirement looks like and how target replacement rates are developed. GAO examined (1) whether and how spending patterns vary by age, (2) key factors used to develop target replacement rates, and (3) the usefulness of information on such rates provided by DOL. GAO analyzed data from the BLS’s 2013 Consumer Expenditure Survey, the most recent available; analyzed 59 articles and reports that discussed how to develop, calculate, or evaluate replacement rates; collected non-generalizable information from 14 retirement services firms and financial planners recommended by researchers and actuaries who have studied replacement rates; and reviewed DOL materials and interviewed officials. Researchers and financial industry professionals develop target replacement rates—the percentage of income to aim for in retirement— based on certain key factors, including spending, household characteristics, and pre-retirement earnings. GAO’s analysis of the literature found that calculating an appropriate replacement rate can be complex. For example, there is debate over whether households that have raised children should target a lower replacement rate than households that have not. In addition, a worker’s pre-retirement earnings could be defined as earnings at the end of the worker’s career or as average earnings over the course of the career. Despite these complicated considerations, target replacement rates cited in the articles and reports GAO reviewed typically range between 70 and 85 percent. Some financial industry professionals told GAO that they develop customized targets that take into account workers’ assets and expected spending, while others questioned the usefulness of replacement rates. Whether older Americans will have adequate income in retirement has been a longstanding concern for several reasons including the decline in defined benefit pensions, the growing responsibility for individuals to save for retirement through employer-sponsored defined contribution plans or on their own, and the financial challenges facing Social Security. To better predict how much income Americans will need once they leave the workforce, many researchers use target replacement rates—the percentage of pre-retirement income needed to maintain a certain standard of living in retirement. In recent years, numerous studies on the replacement rates that households should target have not resulted in a consensus recommendation, in part because estimates are heavily dependent on the underlying assumptions used to develop them. To accurately interpret the implications for retirement adequacy it is important for policy makers and individuals to better understand how these targets are developed. Based on our analysis of 2013 CE data, mid-career households had one of the highest spending levels, while older households generally spent less.15 More specifically, in 2013, mid-career households—those aged 45- 49—spent an estimated average of about $58,500, while young retiree households—those aged 65-69— spent about $46,800, or 20 percent less overall (see Figure 1).16 We also analyzed spending across two broader age groups: pre-retirement households (aged 50-64) and post-retirement households (65-79). We found that the difference in spending between broader age groups was similar to the comparison between mid-career and young retiree households using 5-year age groups. The estimated average total spending for post-retirement households was about 77 percent of the spending levels for pre-retirement households. Spending was lower among mid-retiree and older retiree households compared to mid-career and young retiree households (see Table 2). For example, mid-retiree households (aged 75-79) spent an average of around $34,700, or 26 percent less, than young retiree households. Average spending for older retiree households (aged 80 and older) was slightly less than mid-retiree households at around $31,400, although differences were not statistically significant. The patterns in total spending may, in part, reflect variations in average household size and priorities. The average household size for mid-career households was about 2.9 people as compared to about 2.1 people for young retiree households. The average household size was approximately 1.7 people for mid-retirees and 1.5 people for older retirees. Patterns in spending may also be affected by the age composition of other members of the household. Lower spending for older households could also be indicative of different priorities. For example, one large relative difference in spending was attributable to the personal insurance and pensions category. Mid-career households may be more concerned with contributions toward retirement resources than older households who could already be retired. Moreover, we found that in 2013, age groups varied in how much they spent, including on basic needs, such as food, and non-essential items, such as entertainment. Such fluctuations in spending have implications for the resources households will need to maintain their standard of living. More specifically, spending levels are indicative of how households allocate resources based in part on different needs and lifestyle preferences, and are an important consideration when planning for retirement. While the share of spending was relatively consistent across age groups in some categories, there were larger variations by age for other categories. 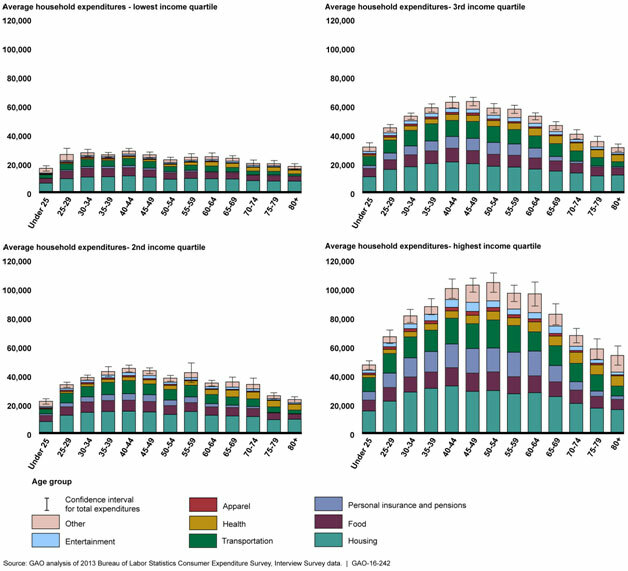 On average, housing was the largest spending category for all age groups. For example, households aged 45 and older consistently spent about a third of total expenditures on housing.20 More specifically, young retiree households spent about 83 percent of the amount that mid- career households spent for housing, on average (see Figure 2). However, the composition of homeowners varied widely by age group. For example, the proportion of homeownership without a mortgage for young retiree households was three times higher than for mid-career households.21 Housing expenditures include expenses such as maintenance, operations, and utility costs that can be incurred regardless of ownership status. In contrast to other spending categories, health care was a larger expense for older households. For example, young retiree households spent an average of around $4,900 on health care, compared to about $3,500 for mid-career households. Older retiree households spent a large share on health care—15 percent of total spending—which was more than double the share that mid-career households spent on health care. 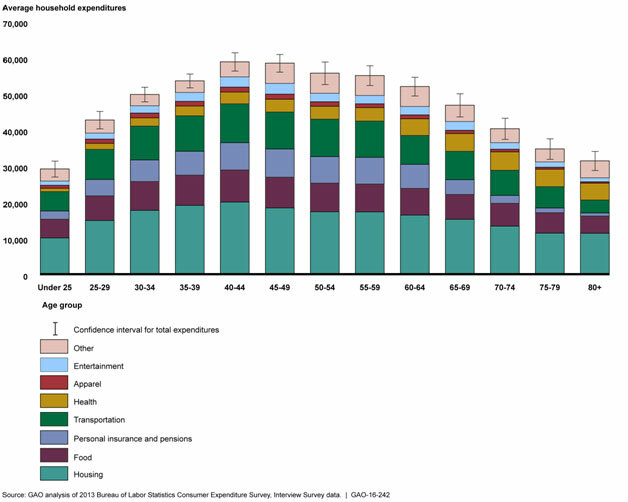 The age at which expenditures peak also shows how spending patterns varied. For example, the amount a household spends on apparel was estimated to peak at age 42, which was significantly younger than for entertainment, where the amount a household spends was estimated to peak around age 52. Spending on items such as apparel and transportation may be more relevant during a household’s working years. Further, spending in some categories may increase with age as households have more time or resources for certain expenses, such as recreational activities. 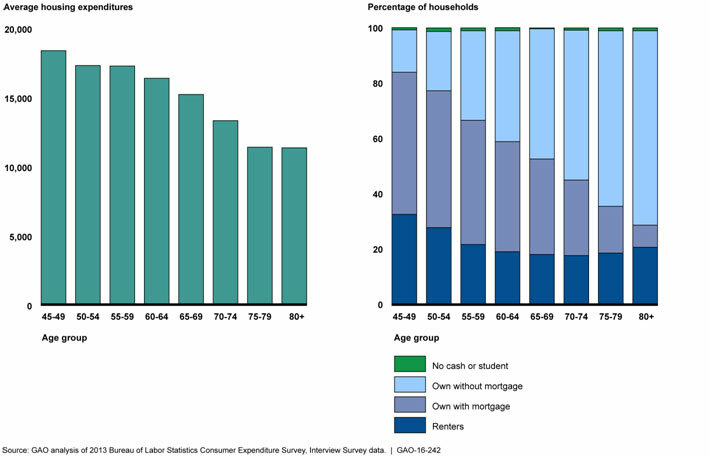 Spending levels across age groups were relatively similar for low-income households, while spending levels were more variable for high-income households (see Figure 3).25 More specifically, the difference in average total spending for low-income households between the mid-career and young retiree age groups was not statistically significant, while the difference across these same age groups was over $20,000 for the highest income quartile. Though low-income households had much lower overall spending than mid- or high-income levels, they spent a larger share on necessities like housing and food, which could have implications for their respective replacement rates. Low-income young retiree households had an average of around $23,500 in out-of-pocket spending, with 39 percent spent on housing and 19 percent on food. In comparison, high-income households in the same age group spent about $82,200, of which 31 percent was spent on housing and 12 percent on food. While spending levels provide information on consumption, expenditures do not necessarily equate to a household’s level of consumption. For example, a household could consume the same amount of food at different expenditure levels based on the difference in cost between preparing food at home versus eating out. Additionally, households may spend money on goods they are not consuming themselves, such as charitable contributions or gifts. Alternatively, some low-income families may receive benefits from public assistance programs that allow for higher levels of consumption than out-of-pocket spending indicates. For example, households may be eligible for programs that offset some of the costs of certain expenses, such as reduced-price school lunch or subsidized housing. Nevertheless, with a substantial portion of spending going toward basic expenses, households with limited resources may not have much flexibility to adjust spending levels. Consequently, a household’s socioeconomic status could affect the level of resources required to plan for future spending needs. We found that accounting for how a household’s spending may change in retirement is an important step in determining a target replacement rate— that is, a recommendation for how much pre-retirement income an individual or household needs to replace in retirement.30 According to the articles and reports we reviewed, assumptions need to be made about the direction and size of a number of expenses, including housing, health care, entertainment, and consumer goods. For example, a retired household may spend less on housing if it pays off a mortgage or downsizes at retirement (see Table 3). Alternatively, spending on housing may increase if a retiree moves into specialized senior housing. The amount a retired household will spend on health care may fluctuate because health care costs can be variable and premiums and out-of- pocket medical costs may rise. Further, spending on entertainment and consumer goods may also fluctuate, according to the articles and reports we analyzed. Entertainment spending could increase because retirees have more leisure time, or alternatively, it is possible that it decreases due to the prevalence of entertainment-related senior discounts. In addition, spending on consumer goods and services, such as ready-to- eat foods or car repairs, may be less in retirement than before because retired households have more free time to engage in in-home production, which includes activities like cooking and household chores and repairs. Moreover, consumer durables purchased prior to retirement, such as furniture or household appliances, may continue working well into retirement and may not need to be replaced. Spending on housing Housing expenses may change in retirement. For example, housing costs may go down if a retiree pays off a mortgage right before or during retirement or a retiree downsizes or moves to an area with less expensive housing. On the other hand, housing costs may go up if a retiree moves to specialized senior housing. Mortgages may not be paid off at the beginning of retirement. According to our analysis of the 2013 Consumer Expenditure Survey data, 35 percent of households aged 65-69 are paying down a mortgage. Health care costs may be more variable in retirement.Health care premiums and out-of-pocket medical costs may change. Spending on work-related expenses Work-related expenses, such as work clothing, meals outside the home, and transportation decline after retirement. Spending on education Retirees who finish paying off their children’s education right before retirement may need to replace less income. Spending on entertainment Entertainment expenses may go up for some retirees and down for others. For example, retirees have more leisure time and may spend more on entertainment. On the other hand, retirees may be able to stretch their dollars on entertainment due to senior discounts. Households may engage in more in-home production after retirement and, therefore, spend less money overall. Consumer durables purchased prior to retirement may last into retirement or may need to be replaced less often. Theoretical views on consumption Individuals may want to smooth consumption over a lifetime, or, more specifically, the marginal utility of consumption. However, consumption or spending patterns in retirement may fluctuate over time. For example, at the beginning of retirement, retirees may spend money on things like travel. Later on, their overall expenses may drop. As retirees age, expenses may rise again due to increased need for health care. Households may spend less in retirement for two reasons. On the one hand, they may spend less because they are content with consuming less, in part because they enjoy leisure time in addition to consumption. Alternatively, they may spend less because they have less income. Some researchers have suggested considering whether people use their savings and assets for spending, and how to account for that when developing a target replacement rate. Retirees may have major debts to pay off. Debt accumulation or reduction could affect the replacement rate a household will need to maintain its standard of living. Socioeconomic status before retirement Replacement rate targets may vary by income level. For example, lower-income households may need a higher replacement rate because they spend a relatively high proportion of their income on non-discretionary expenses such as food, clothing, shelter, and health care. Taxes Taxes may be different before and after retirement. After retirement, many retirees pay less of their income to taxes because they are no longer subject to Social Security payroll taxes, Social Security benefits are partially or fully tax free, and, according to some researchers, there are more income tax deductions for those aged 65 and over. In addition, retirees may be in a lower income tax bracket than prior to retirement. This decreases the percentage of income that needs to be replaced in retirement. People may move to a different state at retirement and, consequently, face higher or lower income taxes. According to the articles and reports we reviewed, household characteristics, particularly household size, play an important role in determining a household’s expenses, its income needs in retirement, and a target replacement rate (see Table 4). For example, the presence of children could also affect what a target replacement rate should be. Researchers do not agree on how having had children affects a retired household’s income needs. According to some researchers, retirees will focus on maintaining spending on themselves and will not need to replace income that went toward their children’s consumption. Further, some researchers have hypothesized that after children move out, the household will save more; and because the household saves more, leaving less money to spend during its remaining working years, the percentage of income that needs to be replaced in retirement is reduced. On the other hand, other researchers have theorized that once children move out, households may not actually consume less. Instead, the parents may choose to use the money they had spent on their children on themselves. Thus, the percentage of income needed to be replaced in retirement may not be lower for retirees who had children versus those who did not. The replacement rate needed for a married versus single household may be different because the cost of living for a couple is not twice the cost of living for a single person. Couples benefit from economies of scale because they share some resources, such as housing. Accounting for these economies of scales may be useful. Different target replacement rates may be useful for married households where only one spouse worked versus married households where both spouses worked. It may be difficult to identify a target replacement rate for a married household if the members of the couple retire at different times, especially if there is a substantial age difference between the two members of the couple. Potential changes in the composition of the household (e.g., change from married to single or vice-versa) could affect the replacement rate a household will need in retirement. Role of children in the household Some researchers have argued that retirees’ goal will be to maintain spending on themselves only and, thus, households that had children before but not after retirement will need a lower replacement rate in retirement. Researchers have also hypothesized that after children move out, a household not yet retired will start saving at a higher rate, which could reduce the percentage of income needed to be replaced in retirement. On the other hand, other researchers have hypothesized that once children leave, households may not actually consume less and save more. Households may have become accustomed to a certain level of spending. Thus, the amount of income needed to be replaced in retirement may not be lower for retirees who had children. Retirees may have adult children move back into their house and, as a result, these children continue to be an expense. Target replacement rates for those retiring earlier may be lower. These households may be saving at a higher rate since they will not have as many years to save for retirement. As a result, they will be living off a smaller percentage of their income before retirement. Low earners had the highest target replacement rates and high earners the lowest target rate, according to studies we reviewed. Some of the studies in our review developed different target rates for workers based on earnings level before retirement. While these studies did not use the same earnings-level groups, their conclusions were consistent. Specifically, Aon Hewitt projected that workers earning under $30,000 would need a 98 percent replacement rate and that workers earning $90,000 would need to replace 79 percent of their income. Lower earners may need a higher replacement rate for three reasons. First, as discussed earlier, they may spend a relatively high amount of their income on non-discretionary items. Second, research has shown low-income households save less than higher-income households. Thus, the reduction in saving in retirement will be less substantial for low-income households and they may need a higher replacement rate. Third, because low-income households pay little in taxes, they receive little in the way of tax saving in retirement. In addition, how pre-retirement earnings are defined and calculated can have important implications for target replacement rates. More specifically, developers of target replacement rates must decide upon a period of earnings to use. Two options cited by the articles and reports in our review are final average earnings and average earnings over the course of a career. A final average earnings measure uses the average of annual earnings for a period of time leading up to retirement. Career average earnings measures, on the other hand, use the average of annual earnings over the course of someone’s career, adjusted for inflation or wage growth. Furthermore, because different definitions of earnings can affect the final target replacement rate, it is important to understand how earnings were calculated and indexed. For example, adding up separate replacement rates provided by defined benefit plans and Social Security benefits to come up with a total replacement rate may not be accurate if the two rates did not use the same type of pre-retirement earnings or index these earnings the same way. Other decisions may need to be made about how to account for work histories or changes in earnings or phased retirement. For example, women often have shorter careers than men. They tend to take a greater number of breaks from the labor force to care for children and elderly relatives. As a result, a replacement rate that uses career average earnings could be distorted by these breaks. In addition, changes to earnings late in a career can have a substantial effect on target replacement rates if final average earnings are used to calculate pre-retirement income. Phased retirement could also change a target replacement rate, depending on how it is incorporated into the calculation. For example, if workers phase into retirement by reducing their hours and earnings over a number of years, then using the average of the final 5 years of earnings could result in a much lower measure of pre-retirement income than using career average earnings. Similarly, how retirement income is defined can have implications for target replacement rate recommendations. Income replacement rates may be a helpful gauge for younger workers who have time to contribute more to retirement plans or adjust their saving. They can also be a useful metric for low- and middle-income households that may find they need to plan for replacing a substantial portion of their pre-retirement income in retirement. These households, in particular, may find they need to spend a sizable portion of their retirement income on basic needs, such as housing and health care. Social Security’s progressive benefit structure will help these households, but they will need other sources of income in retirement through defined contribution plans, pension benefits, or other means to make up the difference. At the same time, however, reports and articles we reviewed demonstrate that developing a customized replacement rate requires careful consideration to appropriately balance all of the underlying assumptions, including those related to determining pre-retirement and retirement income. The wide range of recommended target replacement rates cited in research indicates that there is no rule-of-thumb that will work for everyone. Given these factors, workers may have difficulty understanding what target replacement rate to use based on their circumstances. Further, workers may have trouble operationalizing this information into a realistic savings strategy. This difficulty could be compounded by challenges in understanding how to convert defined contribution account balances into a potential income stream. If workers are unable to translate retirement account balances into income replacement goals, the benefit of replacement rates as a metric or guide is limited. 15 We analyzed the 2013 CE data, which was the most current version of the survey at the time of our analysis. The unit of analysis in the CE is consumer units that comprise (1) all members of a household related by blood, marriage, or other legal arrangement, (2) a person living alone or sharing a household but who is financially independent, or (3) two or more persons living together who make joint expenditures. For the purposes of this report, we refer to consumer units as households and we define spending as direct out-of-pocket expenditures. The 95 percent confidence intervals for average total spending are between $56,014 and $60,890 for mid-career households (aged 45-49) and between $43,586 and $49,996 for young retiree households (aged 65-69). The 95 percent confidence interval for the difference in spending levels between the two groups is between $7,634 and $15,688. For exact estimates and additional information on the confidence intervals, see appendix III. 16 For ease of presentation in this report, we used various age groups as proxies to represent different stages of working and retired life for points of comparison. Similar to other literature analyzing retirement consumption, we use age 65 as a representation of retirement age. Accordingly, we selected 5-year age groupings based on their relation to this retirement age. For example, we used households aged 45-49, who are near the middle of the age group range and younger than retirement age, as a representation of the mid-career stage. We also chose three different age groups as points of comparison for various stages of retirement: young retirees are represented by households aged 65-69, those closest to retirement age; mid-retirees by households 75-79, who are several years older than retirement age; and older retirees by the oldest households, those aged 80 and older. However, actual career and retirement status by age would depend on individual household circumstances and is not known based on their age grouping. For example, some households in the “young retiree” group may not yet be retired, and some households younger than 65 could be retired. 20 Housing expenditures include mortgage interest payments but not payments on mortgage principal. While mortgage principal payments may be significant for some families, we found that including these payments did not substantially alter spending patterns observed since housing was a major expense regardless of whether mortgage payments are included. For more information on our analysis of mortgage principal, see appendix II. For the share of spending on housing for households aged 45 and older, the 95 percent confidence intervals are within +/- 2 percentage points. For additional information on housing expenditure estimates and confidence intervals see appendix III. 21 According to Survey of Consumer Finances estimates, homeownership has declined from a rate of 68.6 percent in 2007 to 65.2 percent in 2013. According to the American Housing Survey, about one-third of elderly households had a mortgage in both 2007 and 2013. Specifically, from the 2007 American Housing Survey, an estimated 5.3 million out of 18.3 million (or 29 percent) of elderly homeowners had a regular or home equity mortgage. According to data from the 2013 American Housing Survey, an estimated 7.1 million of 21.6 million (or 33 percent) of elderly homeowners had a regular or home equity mortgage. See Board of Governors of the Federal Reserve System, “Changes in U.S. Family Finances from 2010 to 2013: Evidence from the Survey of Consumer Finances” Federal Reserve Bulletin, vol. 100, no. 4 (2014); U.S. Census Bureau, American Housing Survey for the United States: 2007, Series H150/07 (Washington, D.C.: 2008); and U.S. Census Bureau, 2013 American Housing Survey for the United States (Washington, D.C.: 2015). 25 Income categories were defined by age-specific income brackets. As a result, for a given age group, each income bracket has approximately the same number of households. For income quartile ranges, see appendix I. 30 Our analysis focused on total replacement rates, that is, the ratio of all income in retirement—including from Social Security, pension benefits, and retirement savings—to pre-retirement earnings. 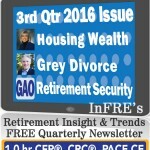 For this analysis, we reviewed 59 articles and reports discussing income replacement rates in retirement. These reports were published in academic journals or by research centers or international organizations. We sought to identify a number of considerations that researchers, policy makers, and financial professionals incorporate into their assumptions when developing, calculating, or evaluating target replacement rates. However, because analyzing the merits and disadvantages of each consideration was outside the scope of our work, we are not endorsing any of the considerations presented in this report. For a complete list of reports and articles reviewed and more information on our methodology, please see the bibliography at the end of this report. Also, for more information on factors that could inform a target replacement rate in addition to spending, household characteristics, and pre-retirement earnings, see appendix IV. [i] Notes: Age groupings are based on the age of the reference person, or the person who rents or owns the home, for the consumer unit. There may be adults in the consumer unit who are older or younger than the reference person. Similar to other literature analyzing retirement consumption, we use age 65 as a representation of retirement age. For ease of comparison purposes, we use age groups to represent various stages of working and retired life based on their relation to this retirement age. [ii] Notes: Age groupings are based on the age of the reference person, or the person who rents or owns the home, for the consumer unit. There may be adults in the consumer unit who are older or younger than the reference person. A consumer unit can comprise (1) all members of a household related by blood, marriage, or other legal arrangement, (2) a person living alone or sharing a household but who is financially independent, or (3) two or more persons living together who make joint expenditures. For the purposes of this report, we refer to consumer units as households. We did not adjust spending levels for household size. Housing expenditures include expenses such as rent, utilities, and mortgage interest payments, but do not include payments on mortgage principal. For more information on mortgage principal, see appendix II. The “no cash or student” category represents housing that is occupied as student housing or without payment of cash rent. The percentage of households in this category for all age groups over 45 was around 1 percent or less. For all average housing expenditure estimates in this figure, 95 percent confidence intervals are within +/- 9 percent of the estimate itself. For housing status shares in this figure, 95 percent confidence intervals are within +/- 4 percentage points. For additional information on the confidence intervals for the estimates in this figure, see appendix III. [iii] Notes: Age groupings are based on the age of the reference person, or the person who rents or owns the home, for the consumer unit. There may be adults in the consumer unit who are older or younger than the reference person. A consumer unit can comprise (1) all members of a household related by blood, marriage, or other legal arrangement, (2) a person living alone or sharing a household but who is financially independent, or (3) two or more persons living together who make joint expenditures. For the purposes of this report, we refer to consumer units as households. We did not adjust spending levels for household size. Income categories were defined by age-specific income brackets. As a result, each income bracket at each age group has approximately the same number of households. See appendix I for income quartile ranges. Income includes some non-wage sources from public programs, such as Supplemental Security Income and unemployment compensation. The “other” category of spending includes expenditures for reading, tobacco, alcoholic beverages, education, cash contributions, personal care, and miscellaneous expenses. The “personal insurance and pensions” category includes deductions for government and railroad retirement, private pensions, and Social Security. According to Bureau of Labor Statistics officials, the private pensions category includes defined benefit, defined contribution, and individual retirement accounts. Housing expenditures include expenses such as rent, utilities, and mortgage interest payments, but do not include payments on mortgage principal.